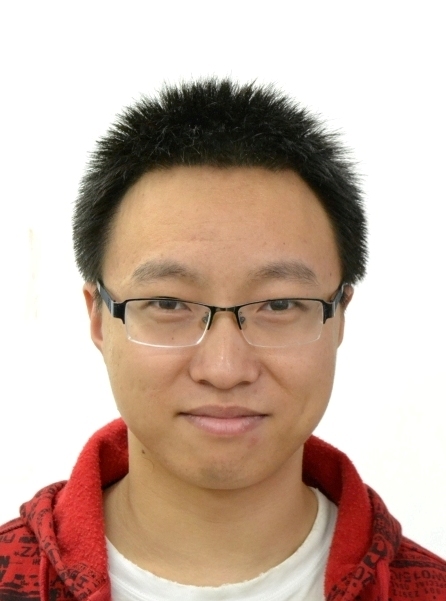 I'm currently a PhD student in Computer Science at Peking University. My research focuses on transportation visual analytics. 2012.9~present: Ph.D. student in Computer Science, Key Laboratory of Machine Perception (Ministry of Education), and School of EECS, at Peking University. 2010.9~2012.7: M.S. student in Computer Science, Key Laboratory of Machine Perception (Ministry of Education), and School of EECS, at Peking University. 2005.9~2009.7: B.S. in Chemistry, College of Chemistry and Molecular Engineering, at Peking University. I joined PKU Visualization and Visual Analytics Group in 2009. My major research interest is transportation visual analytics. I started from studying the micro behaviors of vehicles and pedestrians at a road intersection with laser scanner dataset. It ended up with an exploratory trajectory visual analysis system called TripVista. Later I began to study macro patterns of city scale transportation data, including taxi GPS data and transportation cell data. 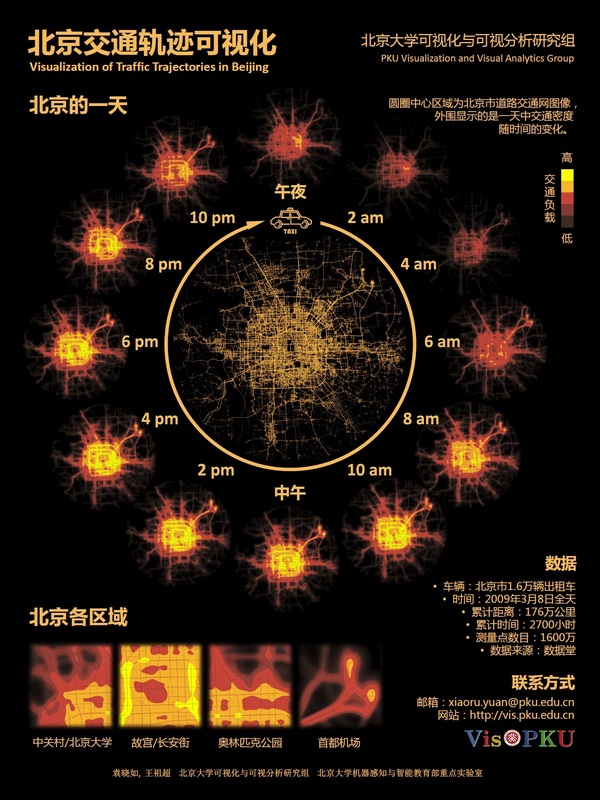 I tried to visualize the traffic jam propagation patterns in Beijing with taxi GPS data, and the traffic network flow patterns in Nanjing with transportation cell data. I hope one day my research can help improve the urban transportation system. Visual Exploration of Sparse Traffic Trajectory Data, IEEE Transactions on Visualization and Computer Graphics (VAST'14), 20(12):1813-1822, 2014. Visual Traffic Jam Analysis Based on Trajectory Data, IEEE Transactions on Visualization and Computer Graphics (VAST'13), 19(12):2159-2168, 2013. Dimension Projection-Matrix/Tree: Interactive Subspace Visual Exploration and Analysis of High Dimensional Data, IEEE Transactions on Visualization and Computer Graphics (InfoVis'13), 19(12):2625-2633, 2013. TrajRank: Exploring Travel Behaviour on a Route by Trajectory Ranking, In Proceedings of IEEE Pacific Visualization Symposium (PacificVis'15), Hang Zhou, April 14-17, 2015, to appear. TripVista: Triple Perspective Visual Trajectory Analytics and Its Application on Microscopic Traffic Data at a Road Intersection, In Proceedings of IEEE Pacific Visualization Symposium (PacificVis'11), pages 163-170, Hong Kong, March 1-4, 2011. Peihong Guo, He Xiao, Zuchao Wang and Xiaoru Yuan. Interactive Local Clustering Operations in Parallel Coordinates, In Proceedings of IEEE Pacific Visualization Symposium (PacificVis'10), pages 97-104, Taiwan, March 2-5, 2010. Urban Trajectory Timeline Visualization. Proceedings of International Conference on Big Data and Smart Computing 2014, Bangkok, January 15-17, 2014. Zuchao Wang, Hanqi Guo, Xiaoru Yuan. Siming Chen, Zuchao Wang, Zipeng Liu, Zhenhuang Wang, Chenglong Wang, Zhengjie Miao, Xiaoru Yuan. MovementFinder: Multiple filters for spatial temporal visual analytics. In Poster Proceedings of IEEE VAST Challenge, Paris, France, November 9-14, 2014. Zipeng Liu, Zhenhuang Wang, Siming Chen, Zuchao Wang, Zhengjie Miao, Xiaoru Yuan. A Platform For Collaborative Visual Analysis on Streaming Messages. In Poster Proceedings of IEEE VAST Challenge, Paris, France, November 9-14, 2014. Zuchao Wang, Hanqi Guo, Xiaoru Yuan, Hao Liu, Hailin Zhang. Discovery Exhibition: Visual Analysis on Traffic Trajectory Data. In Poster Proceedings of IEEE Visualization Discovery Exhibition, Providence, RI, USA, October 23-28, 2011. Zuchao Wang, Hanqi Guo, Bowen Yu, Xiaoru Yuan. Interactive Visualization of 160 Years’ Global Hurricane Trajectory Data. In Poster Proceedings of IEEE Pacific Visualization Symposium, Hong Kong, March 1-4, 2011. IEEE Pacific Visualization Symposium, 2014, 2015.
International Conference on Information Visualization Theory and Applications (IVAPP), 2014. Journal of Visualization, Springer, 2014. Student Volunteer, China Visual Analytics (ChinaVA), Beijing, China, July 2014. Student Volunteer, IEEE Visualization Conference 2013, Atlanta, GA, USA, October 2013. Student Volunteer, IEEE Visualization Conference 2011, Providence, RI, USA, October 2011. Student Volunteer, IEEE Pacific Visualization Symposium 2009, Beijing, P.R. China, April 2009.